Houston marks the third and final Triple Crown race of the 2019 season. CLICK HERE to learn more about the Triple Crown format. 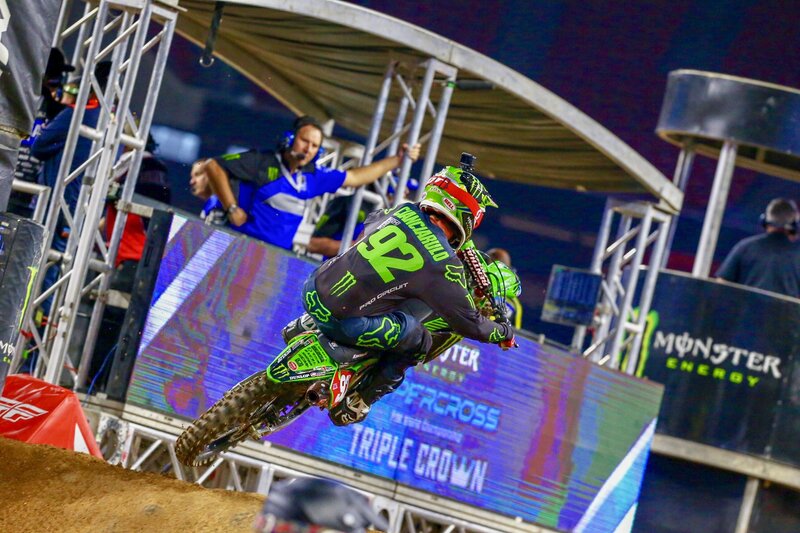 Race recap: Joey Savatgy took the holeshot but it was Marvin Musquin who led Lap 1. Zach Osborne ran in second for the first half of the event but then Cooper Webb and Eli Tomac got by him but were six seconds adrift of race winner Musquin. Tomac was able to move on by Webb for second, but Webb still won the overall and the Triple Crown championship. Race recap: Colt Nichols got the holeshot while multiple riders again went down in the first turn. Dylan Ferrandis started battling his teammate for the lead while points leader Adam Cianciarulo went down on the first lap in another incident. Eventually, Nichols finished ahead but Ferrandis took the overall. Race Recap: Cooper Webb took the holeshot while Ken Roczen was down before the first turn and was out. Second position changed several times throughout the race, going from Dean Wilson to Cole Seely to Musquin and then back to Wilson again when Musquin went down on the final lap. Race recap: The second 250SX Main Event was chaotic from the start, with Adam Cianciarulo overshooting the first turn, running off the track and causing a couple of other riders to go down. Chris Blose took the lead with Dylan Ferrandis in close pursuit. Blose crashed out and, just moments later, Cianciarulo went down after the over-under. His bike unsighted to the other riders meant that his Kawasaki got ran over twice before he could get back on. 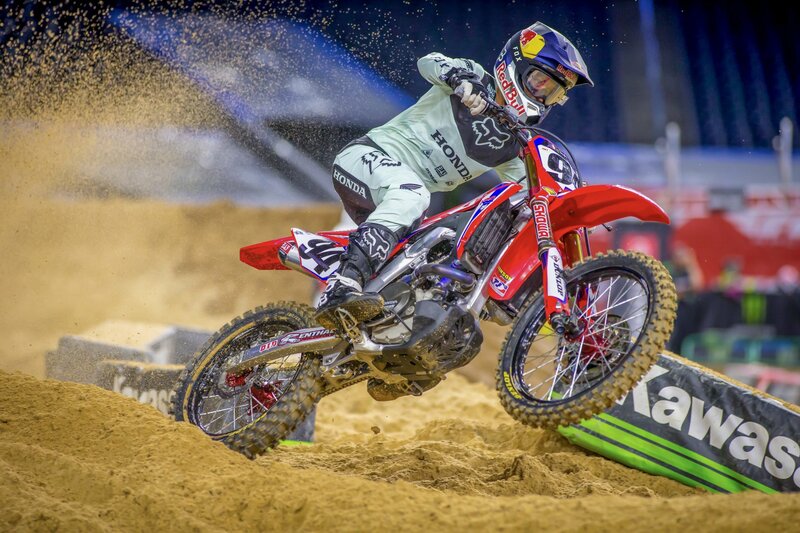 Race recap: Ken Roczen took the holeshot and dominated the race. Dean Wilson ran in second while the KTM teammates of Cooper Webb and Marvin Musquin got into each other on multiple occasions while battling for third, with Webb coming out on top. Webb took second from Wilson. Musquin tried to take third back from Wilson but got knocked off track and off the podium. Race recap: Shane Mcadoo got the holeshot but crashed before they got to Turn 2, giving Adam Cianciarulo the early lead. Dylan Ferrandis was the rider on the move, coming back to finish on the podium after dropping to eighth on the first lap. Austin Politelli, Adam Enticknap, Carlen Gardner and Charles Lefrancois raced their ways in to tonight’s Main Events. Brandan Leith, Killiam Auberson, Mathias Jorgenson and Martin Castelo transferred to the Main after a dramatic race in which Vann Martin – who had dominated most of the race – crashed out of the lead on the final lap.